See data collected in and used for our home (16WW) and elsewhere, open for research use. A selection of data collected and used, especially at home (16WW). I intend to organise and collect more of it here, and graph it (and show the tools to graph it). Some datasets on this site will be marked up on other suitable pages, but the default location for all sets' Dataset JSON is this page. At worst, looking at the source of this page with a text editor should reveal it. This page also references circuit diagrams/schematics. I've collected much data for our house at 16 Willingham Way (16WW) referred to in the various documents on this site. Much of the data can be found here and is browsable, in simple text formats such as CSV. Common compression techniques have been applied for larger/non-live data sets. 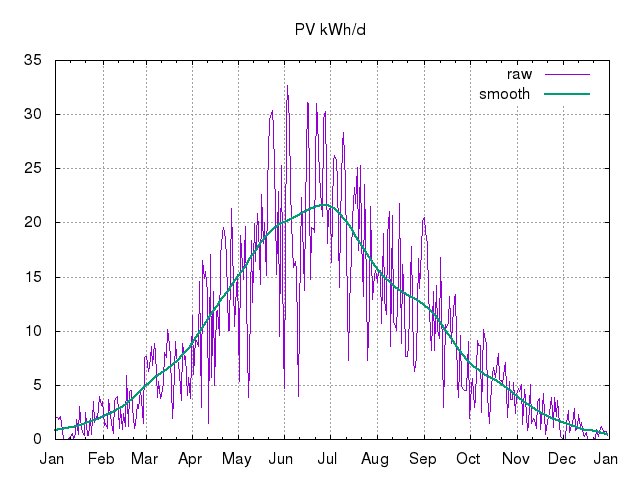 1-minute SunnyBeam PV grid-tie power generation by day. 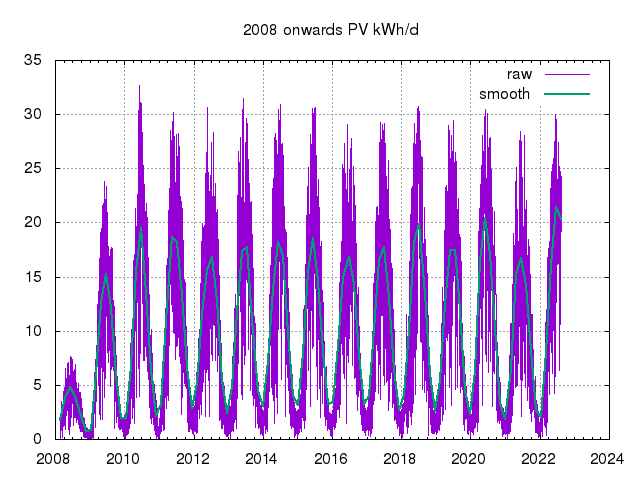 daily SunnyBeam PV grid-tie generation value by year (EYYYY.csv) and raw. 10-minute off-grid battery and server power-consumption values by day and historic from k8055 board. See K8055 and RPi/MODBUS storage data sets. OpenTRV 16WW sensor values by day. 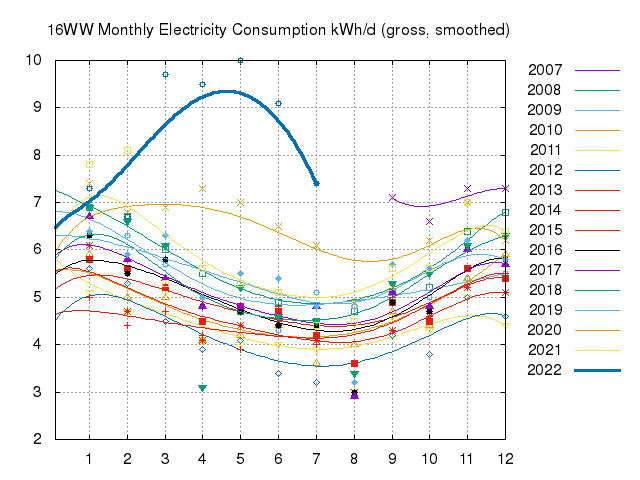 Enphase AC Battery data including consumption and flows. 16WW energy meter (and HDD) values by month. Atom feed of latest updated files. To set a baseline and understand better what needed fixing, I had SAP, air-leakage and other tests done in early 2009. See live generation output when possible. 2008/02/25: the first phase/round of PV, 1.29kWp (west-facing, 6 x Sanyo HIT 215Wp hybrid crystalline/thinfilm panels with SMA SunnyBoy 1100 inverter), was installed. 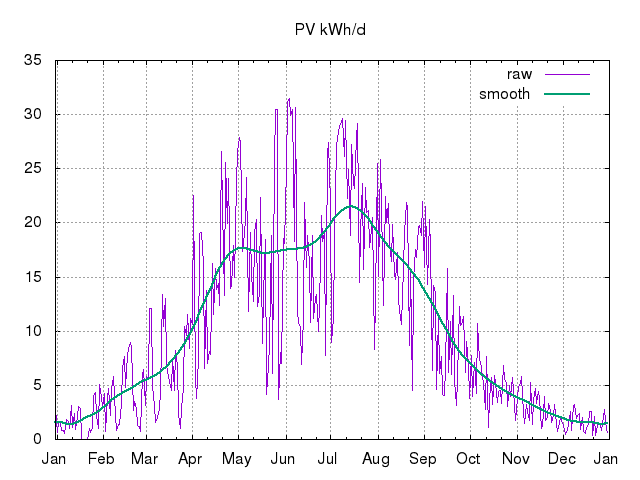 See the 2008 daily PV generation logs for 2008 as .csv and .png chart. 2009/02/10: the second phase was installed, taking the system to 3.87kWp; same panels and inverters for each of the two new east-facing strings as for the first phase. 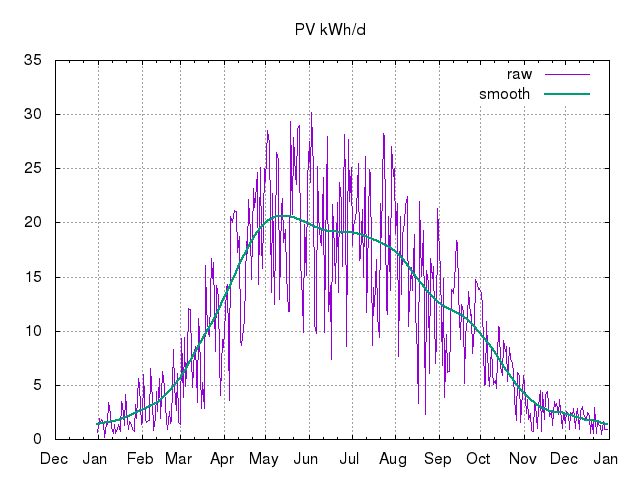 See the 2009 daily PV generation logs for 2009 as .csv and .png chart. 2010/04/26: the third phase (west-facing, same panels, SMA SunnyBoy 1200 inverter) of 1.29kWp was installed, taking the whole system to 5.16kWp. New tariff and generation meter for this last part. 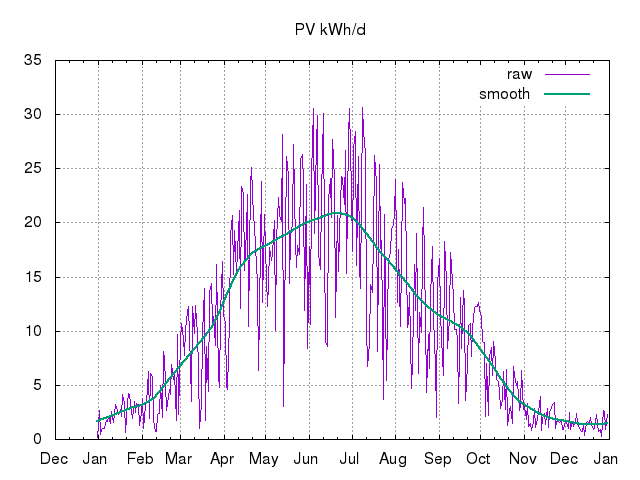 See the 2010 daily PV generation logs for 2010 as .csv and .png chart. 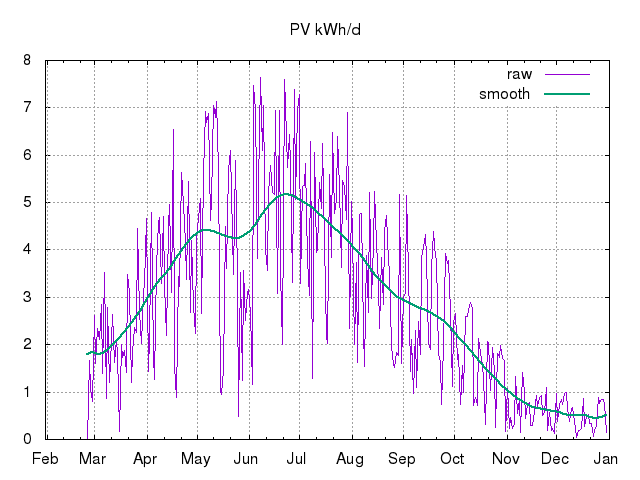 See the 2011 daily PV generation logs for 2011 as .csv and .png chart. 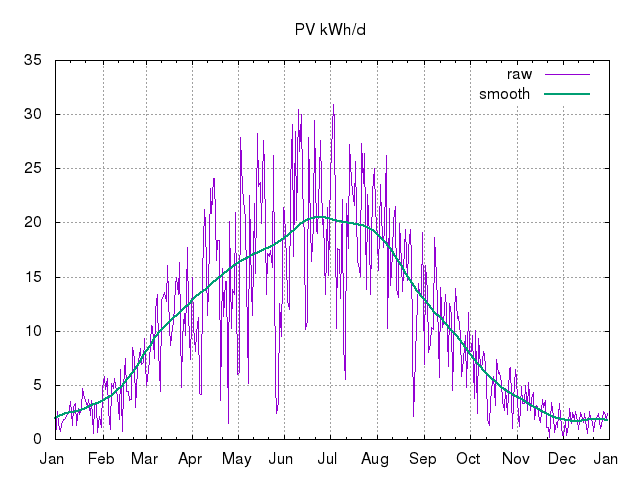 See the 2012 daily PV generation logs for 2012 as .csv and .png chart. 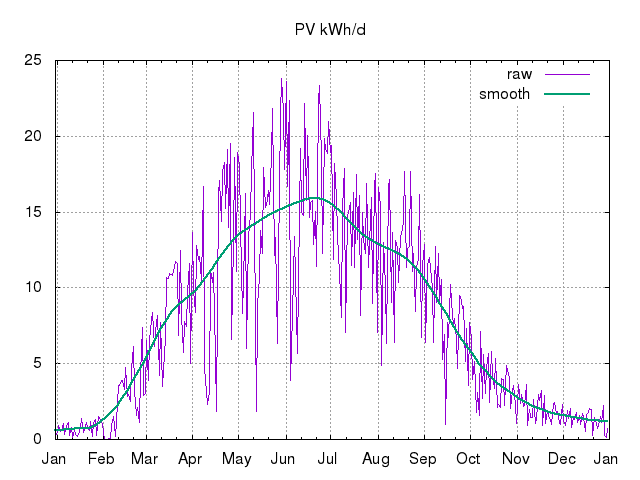 See the 2013 daily PV generation logs for 2013 as .csv and .png chart. 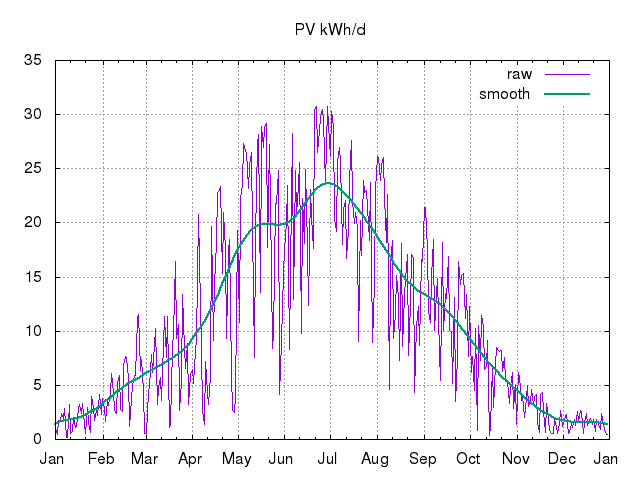 See the 2014 daily PV generation logs for 2014 as .csv and .png chart. 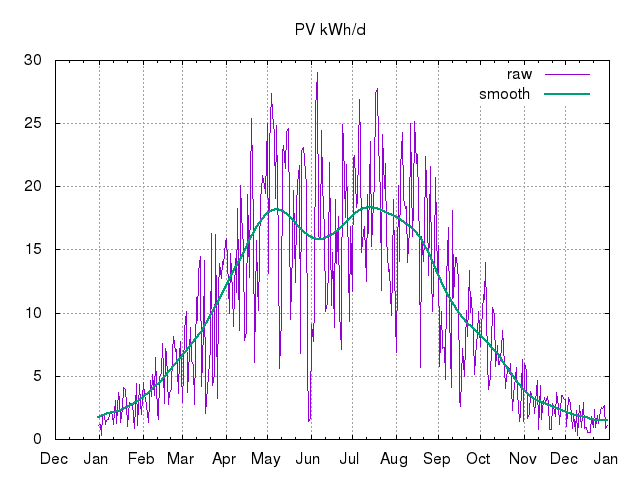 See the 2015 daily PV generation logs for 2015 as .csv and .png chart. 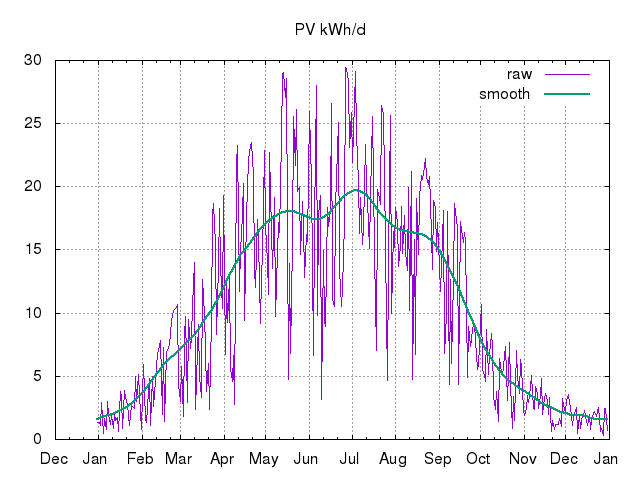 See the 2016 daily PV generation logs for 2016 as .csv and .png chart. See the 2017 daily PV generation logs for 2017 as .csv and .png chart. See the 2018 daily PV generation logs for 2018 as .csv and .png chart. 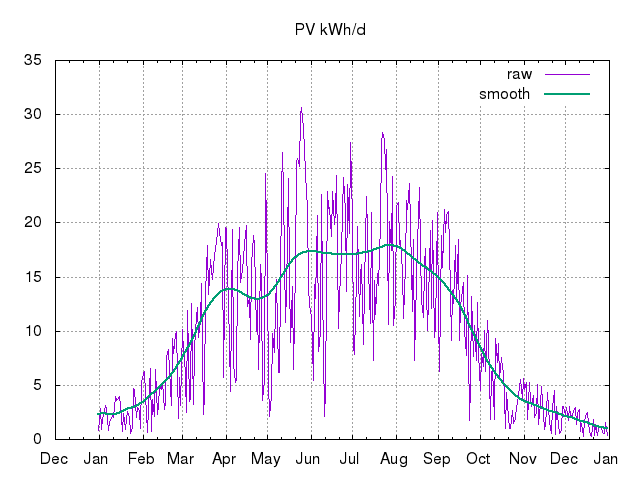 See the 2019 daily PV generation logs for 2019 as .csv and .png chart. See other system performance records, including per-string outputs. Rob produced lovely tweaked graphs from my raw data up to September 2012. Thanks, Rob: great job! The entire raw data set is now available, including new samples as I take them, though with many caveats (beware timestamp wobbles in particular). See the interesting 2015/03/20 (cloudy) morning dip in PV output (raw SunnyBeam data with time offset, per-minute data) during the partial solar eclipse (~85% maximum at ~09:30). Here is an extract of the numbers from the PVGIS estimate not knowing anything about our local trees, etc! I log some aspects of my off-grid system such as live values for voltage, calendar month chart, and historic stats. Monthly meter readings and comments. Partial monthly summary of local HDD12 (base temperature of 12°C) data suitable for gnuplot to digest. See 16WW water mains inlet temperatures for an idea of how much extra "lift" is required by the DHW system in winter, for example. 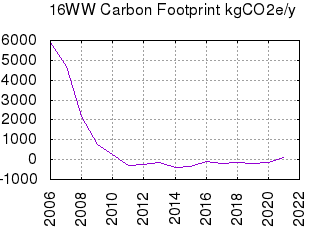 See some manual relative humidity (RH) measurements at 16WW. Also in the context of thermal discomfort. 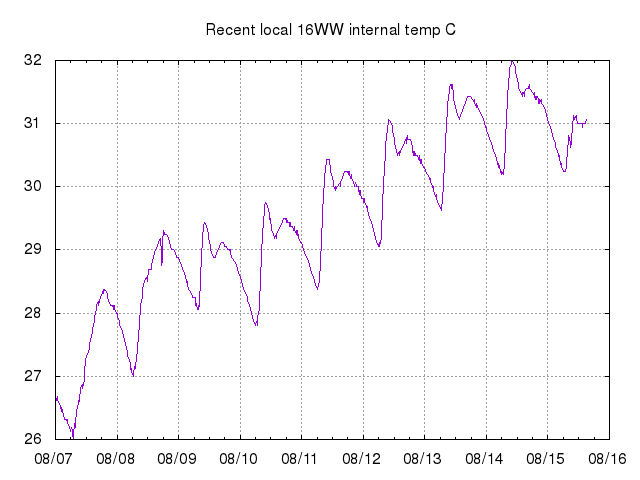 See a graph of local internal temperature at 16WW collected from an OpenTRV unit tethered to the Web server. 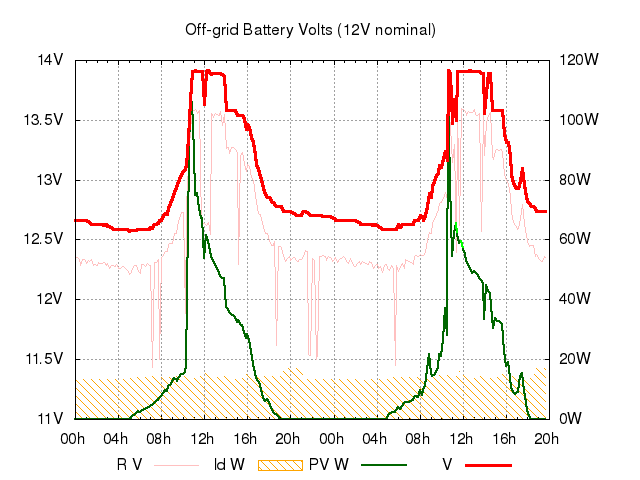 sensor battery voltage and off-grid main battery temperature. valve % open (not live). valve % cumulative movement (not live). ambient light levels and deltas (not live). and also see a 2016/09/22 snapshot. 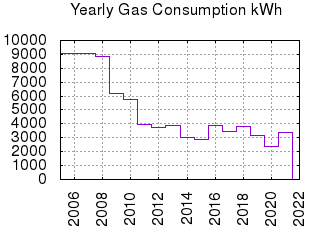 See initial data sets for server-local and all sensors, including external, for the end of April 2014. See the OpenTRV/16WW public data set. Note that data formats have evolved over time, but are all plain text, in various common compressed archive formats for speed of download, etc. 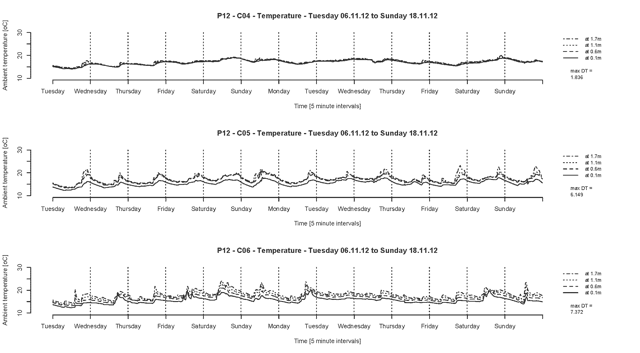 See: A Note On iButton Temperature Logging of Insulation Performance and data set. 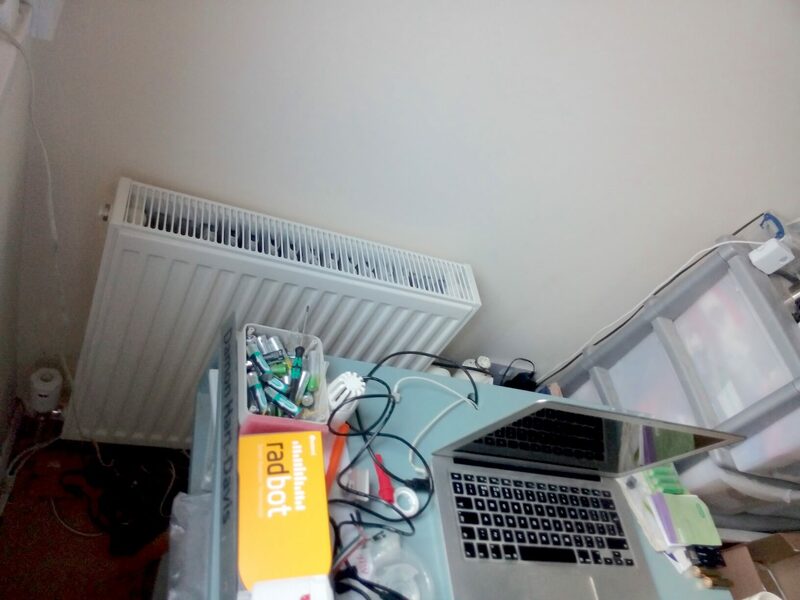 I look up the offer at MyJoulo to place a small widget on top of my thermostat for one week to analyse our heating. Our unit arrived 2012/12/17 and ran until Christmas Eve. Note that from early evening 2012/12/19 I lowered the radiator flow temperature from about 60°C to about 45°C, independently of this, to see if the i30 PRC/eTRV could work with a lower heating rate. The reduced flow temperature seems to help reduce overshoot both in the target bedroom and in the living room, though the motivation was to try to test at typical heat-pump temperatures. Note that we don't leave our house thermostat in the living room alone; we keep it lowish unless we feel cold and/or we want to force the heating on for the children's bedrooms before they go up. 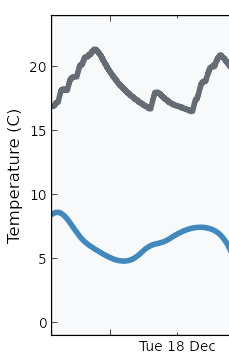 The latter action would be unnecessary if we had zoning with each bedroom able call for heat independently and those wasteful and soporific peaks >19°C could probably be trimmed. In the interim we should probably make sure that we get the thermostat down to ~18°C as the children go to bed to minimise overshoot. 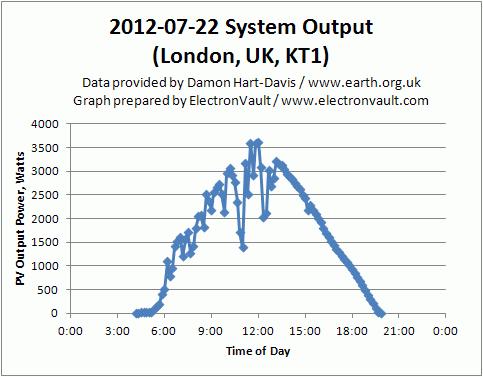 A friend has generously provided his raw CSV data and chart too (from somewhat east of London), for comparison. In his case there is evidence of much tighter temperature control, at a similar mean level to ours, even with lower external temperatures. 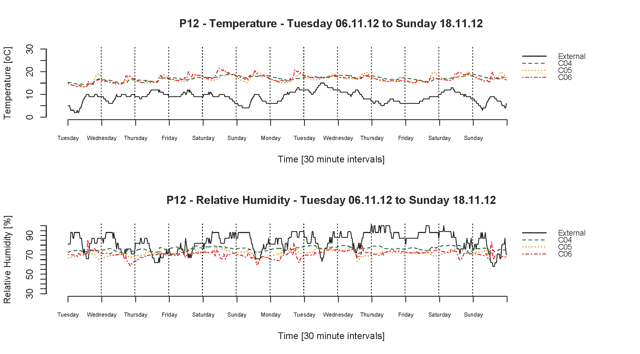 At the end of 2012 I participated in a UCL Energy Institute/LoLo study on responses to thermal discomfort, in return for access to the raw data collected by them on temperature and relative humidity at 16WW, which overlaps with some of my iButton mission 4 data collection. See the underlying raw data (note the room codes above on the filenames) in Mac .csv file format (with lines CR terminated, not CRLF or LF), c/o Stephanie Gauthier (then) of UCL whose project this was for, ZIPped. I did not have much joy attempting to measure "air quality" with the AQE Air Quality Egg. These things are hard to do well and cheap at the same time. Off-grid PV system schematic (Ki-CAD) including various snapshots image/other formats. (archive) 2011/07/25: off-grid (lead-acid and LiFePO4/LFP) power system circuit diagram .SHX, PDF. All historic logging data from the k8055, mainly off-grid numbers, is available under data/k8055/YYYY-MM.gz, and a log of system changes is at the end of the historic stats. See also, for example Battery State-Of-Charge Chart For Voltage & Specific Gravity and Batteries Maintenance 101. A person exhales ~1kg/d of CO2 (~0.5m^3). 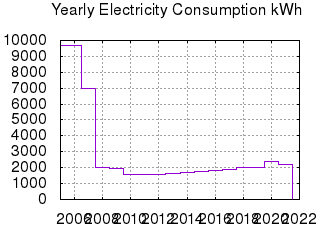 A continuous 1W UK mains electricity draw costs ~1£/y circa 2012. Our portable dehumidifier (2011 vintage) consumes ~1kWh to remove 1kg of water from the air (and is a CoP>1 heater). It may have been managing to extract a peak of ~2l/2kg per hour, eg helping to dry out a recently-plastered room (2015/12/09). Q10=2 applies to max absolute humidity vs air temperature (ie equilibrium absolute humidity approximately doubles (and so %RH halves for a fixed g/m^3 of water) for each 10K (or °C) increase in temperature). Heat capacity of water ~116kWh/t for a delta-T of 100K (~10t/MWh), ~90kWh/t for a delta-T of 80K, ~60kWh/t for a delta-T of 50K (eg from 90°C down to 40°C in a DHW tank), or 2.3kWh for 200l DHW tank falling from 55°C to 45°C or mains at 10°C preheated to 20°C in winter (10K) and note tank losses ~1kWh/d ballpark. Compare with well under 30kWh/t for lead-acid batteries (16kWh/t for AGM @ typical 50% DoD), 100kWh--200kWh/t for Lithium-chemistry batteries. Approx lighting levels for office and better lit parts of home 400lux, dimly lit living areas of home 80lux. Fieldlines thread: ... the consensus was that a good cyclist can achieve 150 watts hour after hour, a professional cyclist can do 200 watts all day, and at Olympic level they can mange 250 watts for an hour or two but still keep up the average 200 watts. A 'normal' adult can maybe sustain 100W for a reasonable time, and note that resting heat output is also 100W, presumably leading to nearly 200W total output. Hours of sun per year USA vs Europe: SW US 3500+, UK south coast 1800--2600, north Scotland <1200. Code used to collect and compute GB grid intensity numbers, live and historical, published under an BSD-style free/open licence on GitHub: reutils. Just for giggles, note that there's nothing secret about the makefile used to build this site, though note that for tidiness not all of the supporting scripts are in public view. If anyone really cares I can make some or all of them visible too. 2012/04/02: Domestic energy use map of Britain down to very small areas giving consumption averages for ~6000 people. Area E02000602 in Kingston upon Thames: average consumption of gas, per meter, kilo-watt hours: 13,143kWh, average consumption of electricity, per meter, kWh: 4,106kWh (cf ~6,000 and ~1,000 respectively for us). 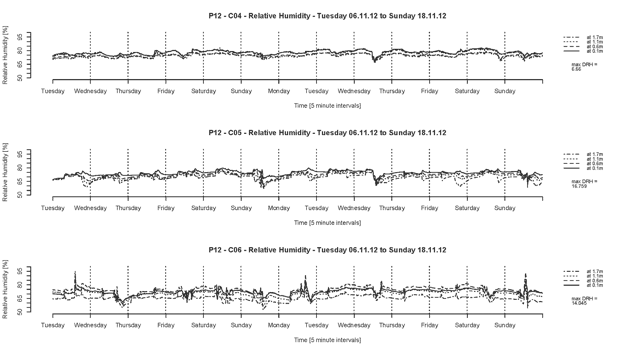 3-hourly weather forecast and observational data - UK locations. Met Office 3-month outlook for contingency planners. Renewable UK's UKWED Wind Energy Database. Elexon Electricity Data Summary page for the GB grid. 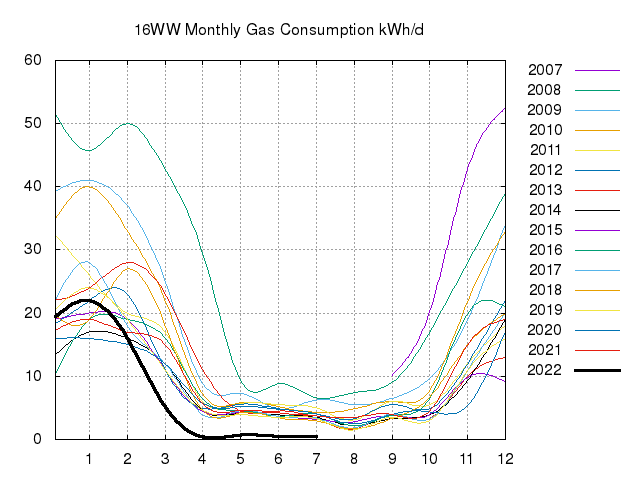 GB gas grid operational data and especially the Prevailing View. Data on short-term PV generation fluctuations "Note that a significant fluctuation of, let us say, more than 3% in 1s, is relatively rare. ... 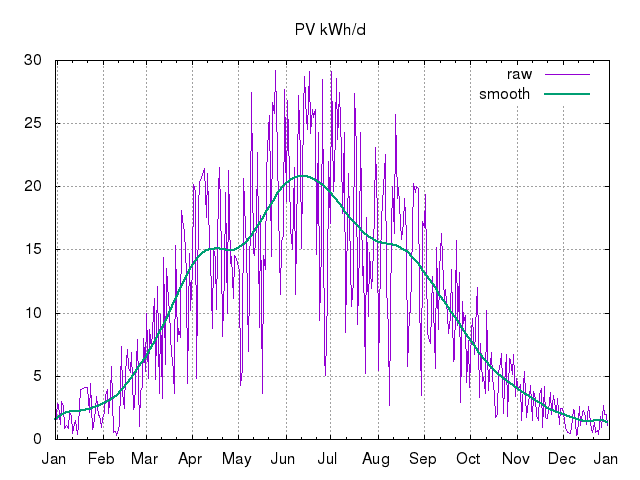 However, the relative frequency is close to 41% at 600s" and "The geographical dispersion of the PV plants is a highly effective way of smoothing the power fluctuations, even for ten minute sampling intervals. It is sufficient to locate two PV plants at a distance of 6 kms, one from the other, to ensure that the fluctuations over 10 minute intervals are independent of each other and are smoothed out when combined."